Sam S. Chang, MD, MBA, is the Patricia and Rodes Hart Endowed Professor of Urologic Surgery and Oncology, and the Oncology Fellowship Director and Vice-Chair of Urologic Surgery at Vanderbilt University Medical Center in Nashville, Tennessee. Dr. Chang, a graduate of Princeton University and Vanderbilt University Medical School (where he earned a full 4-year Justin Potter Scholarship), completed his uro-oncology fellowship as Chief Fellow at Memorial Sloan-Kettering Cancer Center. He has also recently completed his MBA at Vanderbilt’s Owen School of Business. Since his return to Nashville, he has focused on urologic oncology and education and has led efforts in integration of evidence-based medicine in clinical pathways, enhanced national guidelines formulation, and improved urologic cancer staging. He has orchestrated the initiation and expansion of multiple cancer-related treatment protocols. Dr. Chang has served as the Chairman of the SUO Panel on Hormone Refractory Prostate Cancer, the chair of the American Joint Committee on Cancer GU Staging Task Force, the Facilitator and Vice-Chair of the Renal Malignancy Follow-Up AUA Guidelines Panel, the Chair of the AUA/ASCO/ASTRO/SUO Guidelines on Nonmetastic Invasive Bladder Cancer, and the Chairman of the AUA Prostate Cancer Core Curriculum Committee. He served as the initial national Prostate Cancer Editor for the AUA Core Curriculum. He is a current member of the NCCN Kidney Cancer Panel and is a Senior Editor of the American Board of Urology Examination committee. In addition, he was named an AUA-EAU Academic Exchange Fellow. Dr. Chang has authored more than 275 original publications, multiple book chapters, and edited several textbooks. For his academic efforts, he received the SUO’s first-ever Distinguished Service Award, a CaPCURE Prostate Cancer Young Investigator Award, and has been named multiple times as a Journal of Urology’s Best Reviewer. He received of the American Urologic Association Gold Cystoscope Award and completed a term as a nominated Fellow of the Nashville Health Care Council in 2016. He has been elected (2018-2022) as Assistant Secretary of the American Urological Association in charge of International Relations with Europe and the Middle East. 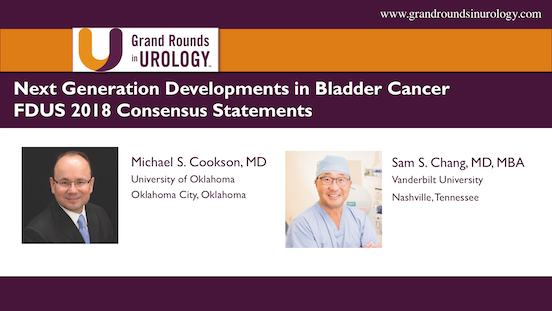 Sam S. Chang, MD, MBA, and Michael S. Cookson, MD, led the “Next Generation Developments in Bladder Cancer” session at the Future Directions in Urology Symposium (FDUS) 2018. These consensus statements represent a comprehensive analysis of current issues, challenges, and advancements in urology from a panel of international experts. 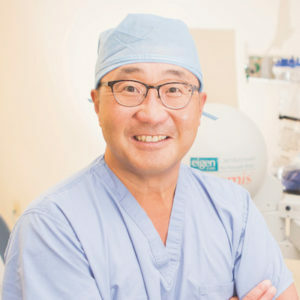 Sam Chang, MD, MBA, who has served as chair of the American Urological Association (AUA) guidelines panel for non-muscle invasive bladder cancer (NMIBC) and muscle invasive bladder cancer (MIBC), provides an overview of updated non-metastatic MIBC treatment guidelines, including a comprehensive treatment algorithm. He also discusses directions of future research for the disease. Robotic Cystectomy Versus Open Cystectomy: What Do We Know? Sam Chang, MD, MBA, delineates the benefits and shortcomings of both robotic and open cystectomy, specifically in terms of morbidity, compilation, and recurrence rates for patients, and the learning curve associated with each method for clinicians. He also discusses how the financial cost of robotic surgery factors into this comparison. Robotic Cystectomy Versus Open Cystectomy: Do We Really Need to Discuss?